There is just something so decadent about having a bit of chocolate with your breakfast, isn’t there? Growing up (and even now), one of my favorite things to have for breakfast (and it was only done on nights I had sleepovers or special occasions like my birthday) was chocolate chip pancakes. I mean…it’s the perfect amount of chocolate, so you sort of feel like you’re being wicked…but really, you’re just indulging that sweet tooth a little bit. Well, I often do my own take on something with chocolate in it for breakfast every now and again. The problem is…I’m in charge of making it. And there are definitely mornings when the last thing I want to do is stand around in the kitchen and attempt to make a decent (and decadent) breakfast when I’m already short on time or just…busy. Well, it just so happens that Nature’s Path has released a new product in its gluten free line-up. And I just happened to be shopping in a different Kroger this past weekend and stumbled across it. You better believe the moment I saw it, it was going into my shopping cart. My grocery list wasn’t very long this week so I had a bit of wiggle room. And having something quick and easy on hand for breakfast is never a bad idea. Especially when it involves dark chocolate. 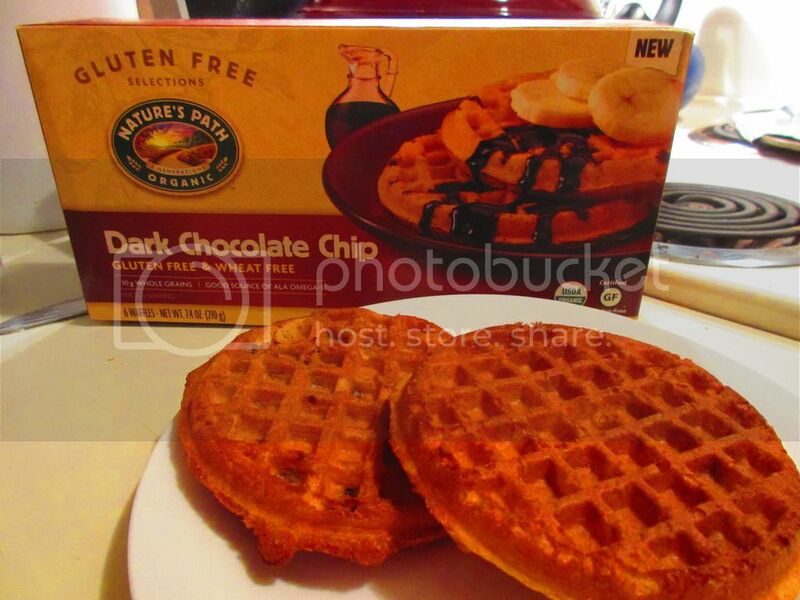 Nature’s Path Gluten Free Dark Chocolate Chip Waffles…are a gift from heaven. The gluten free heaven. Where chocolate reigns and waffles are all the rage. Seriously. I love chocolate chip anything…but chocolate chip waffles are a rare frozen find…in the gluten-free realm of the grocery store. Homestyle…perhaps blueberry…maybe an oddball pumpkin or berry…but…dark chocolate…that’s not a common find. Nature’s Path is known for their healthy, great-tasting organic foods. One of their biggest incentives is to promote sustainability…and that’s why growing organic, healthy food is their passion and the cornerstone of this family company. But, in addition to that, they naturally want to put out products that they can stand behind, making sure that everything that hits the market is delicious and exciting. Because healthy food doesn’t need to be boring and tasteless. And, I can promise you that there is nothing boring about the Nature’s Path Gluten Free Dark Chocolate Chip Waffles. Nothing. I toasted them in my oven this morning while I took a shower after my spin class. I gave 2 waffles to my roommate and I settled in with another two. A drizzle of agave maple syrup was the only flourish I had on these. And they were spectacular. They got to this amazing golden color in the oven, crisping up gorgeously on the outside. Inside, aside from the rich dark chocolate chips was a soft center that just begged you to carve off another bite and indulge once again. It was amazing that my waffles weren’t just hoovered off the plate this morning. But I did take my time, to chew and to enjoy, each and every single bite. What good is food if you don’t savor it a little, right? So, let’s discuss the ingredients that Nature’s Path puts into their Gluten Free Dark Chocolate Chip Waffles! These waffles are made from water, organic brown rice flour, organic potato starch, organic corn flour, organic chocolate chips (organic granulated sugar cane juice, organic chocolate liquor, organic cocoa butter, soy lecithin, organic vanilla extract), organic soy oil, organic tapioca starch, organic granulated sugar cane juice, baking powder, organic potato flour, organic soy lecithin, organic pear juice concentrate, organic flavor, and sea salt. These waffles are vegan, gluten free, and contain 10 grams of whole grains per serving and are a fantastic source of ALA Omega-3, meaning they are nutritious…indulgent…and tasty. What a great combination from the freezer aisle, yes? As for nutritional information, for waffles with dark chocolate in them, these aren’t too bad on the caloric scale. A serving size is two (2) waffles. There are 3 servings per box (I hate this…I wish I could at least get an even number of servings). Each serving will provide you with 220 calories, 7 grams fat, 2 grams saturated fat, 0 grams trans fat, 3.5 grams polyunsaturated fat, 2 grams monounsaturated fat, 0 mg cholesterol, 490 mg sodium, 34 grams carbohydrates, 0 grams of fiber, 7 grams sugars, and 2 grams of protein. I think my biggest complaint was that after I feasted on two of these waffles, I was hungry about an hour and a half later. The lack of filling fiber and the small hit of protein are much to blame for this. And…even with only 7 sugars…it is still a waffle. So, definitely pair this (or just 1) with something with protein. Instead of maple syrup, perhaps a spoonful of nut butter would be nice. Actually…that does sound frickin’ fantastic. I think I want to do that tomorrow with the last couple of waffles. YUM! Dark chocolate chip waffles sound decadent, but they just bring one of the best flavors in the world (chocolate) to your breakfast table. And now, even the gluten-free consumer can easily pop these into their toaster and have an indulgent, delicious breakfast…without having to whip them up themselves. Leave the waffle mix, mini chocolate chips, and the waffle iron in the pantry. Thanks to Nature’s Path…you just have to reach into your freezer. And for that, I am one very happy chocoholic. This entry was posted in Breakfast, Chocolate, Entree, Food, Frozen, Gluten-Free, Products, Review, Sweet Stuff, Vegan, Vegetarian, Waffles by The Celiathlete. Bookmark the permalink.